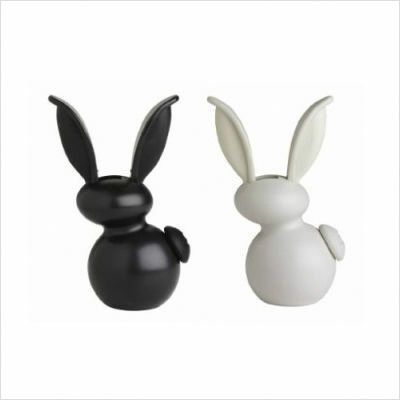 This Chef’N G’Rabbit Jr. Salt and Pepper Set are mini versions of the popular G’Rabbit’s™. These are a really cute and cool (can they be both – yes!!!) addition to any kitchen or dining table. Made from carbon steel with a ceramic rasp they are sturdy little bunnies! The Chef’N G’Rabbit Jr. Salt and Pepper Set comes filled with fresh peppercorns and sea salt and you just squeeze the rabbit ears to dispense the condiment of your choice! These salt and pepper mills are magnetized and will attach to any metal surface in your kitchen – funky fridge magnets anybody? The Chef’N G’Rabbit Jr. Salt and Pepper Set are available at $19.99 here. Previous articleUmbra Magnetic Key Organizer – A Gift with Attraction Guaranteed!